Mindbody is a business management software oriented towards the booming health and wellness industry. It is an all-in-one online software that not only tracks your sales but can be used for client sign-ups, a customer database, employee time tracking, and more. Not only does it track all of this but it supplies reports that can be used to analyze your sales to better increase profits. WHY IS MINDBODY THE #1 SOFTWARE FOR GYMS, SALONS AND SPAS? Need an easy way to track sales across multiple service and product categories? Mindbody’s there for you! Need a list of clients for your upcoming class? Just a click away! Need to track the effectiveness of marketing campaigns? You got it! Mindbody is perfectly catered towards the health and wellness industry to give you everything you need out of a POS system. Not only does it have all the features you need to run a successful gym, spa, or other health business, but it syncs in with Xero! To sync Mindbody to Xero, you’ll first need to login to your Mindbody account. From the home page, select “Manager Tools” and then “Xero Integration.” Simply follow the steps on the screen to sync all of your sales categories, tax types, and more. A detailed, step-by-step guide can be found on the Mindbody site. If you ever want to make adjustments to your sync settings, you can access this through the same page. Let's pretend that you aren't using the #1 accounting software for small businesses, and you are manually reconciling your sales. Below, we’ll review what that process would look like, which is great to understand even if using the automatic sync. It’s worthwhile to know exactly what is coming into your accounting software, why, and what to watch out for. 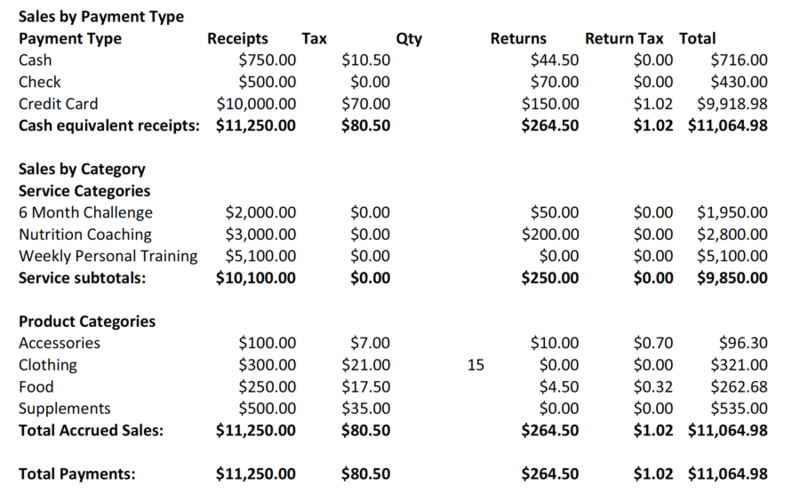 WHICH SALES REPORTS DO I NEED TO RECONCILE MINDBODY WITH XERO? You can see there are a few different sections of the report. First, you can see the breakdown of payment types between cash, check, credit card, and any other payment types you have setup. It will also show details on taxes, returns, and the quantity of items sold. This is a useful report to use when counting down your cash drawers. On the above report, you would hope to have $716 in your cash drawer at the end of the day. Any amount above or below this would need to be recorded as a Cash Discrepancy. The second section lists all of your sales categories and also separates these into services (non-taxable categories) and products (taxable categories). 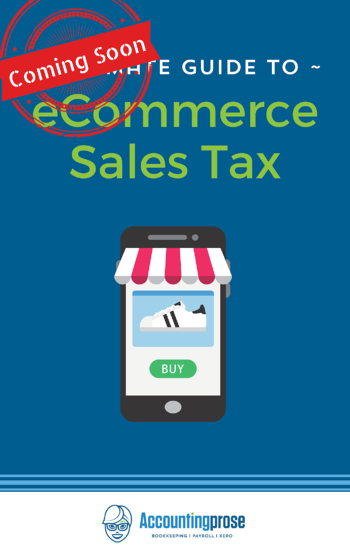 This section is especially useful when filing sales tax. You can easily see your total taxable income, your deductible services, and the tax collected. You want to make sure you are recording your sales minus any refunds. In the example above, you had $1,135.50 in product sales ($1,150-$14.50 in refunds) and $9,850 in service sales ($10,100 - $250 in refunds). You can set up any number of sales categories to help you better track the variation of services and products sold. This gives you a detailed view into which categories are performing better than others. At the bottom of the Daily Closeout report, you will see all totaled payments and refunds across both service and product categories combined. Now what do I do with all these numbers? Using Mindbody and Xero makes it easy to see all your sales broken down by category, as they will automatically sync into Xero for you. Here is how you would reconcile the above report without an automatic sync, by crediting all money coming in (revenue + sales tax) and debiting payment tenders. Since this entry already records your income, you would book any bank deposits against the same cash, check, and credit card clearing accounts. When you record $716 in cash sales and then deposit $716 to your bank, the “Cash” account will zero out, showing there is no more cash due to you. All of the payment tender accounts work the same way. 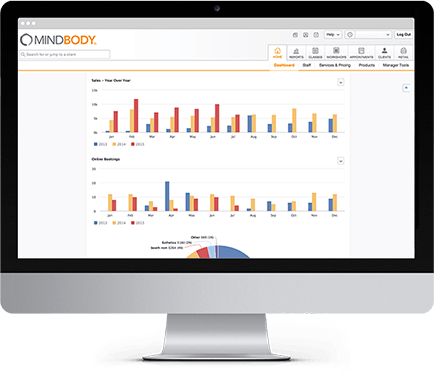 HOW DO YOU USE MINDBODY REPORTS TO BOOST YOUR PROFITS? As you accumulate data into your accounting file, you can begin to see trends. Usually this takes about three months for trends to begin to present themselves and six months for data to gain some traction. Be sure that you are tracking revenue by profit center- for example, group or individual classes, membership income, supplement income, product income. If you want to get even more granular, be sure that your chart of accounts supports the level of detail that you desire. Take a look at these profit centers and see what is happening. Does the outcome match your business plan? Does one area of your business need a little boost? By looking at your financials on a month over month basis, you can take action quickly when things aren't going well. Leverage your Xero accounting file, instead of scratching your head at the end of the year. WHAT OTHER REPORTS CAN YOU USE TO BOOST YOUR BOTTOM LINE? Last Visit Report – You can use the Last Visit Report to search for clients who have not checked in since a particular date. If a client is not using your facility, they are at risk of cancelling their membership. Perhaps you can send them a check-in email, or a coupon for a free shake at the juice bar. Running a successful gym is not just about current number of members, but maintaining and adding to those memberships for months and years to come. Sales Report – Although the Daily Closeout report is our favorite sales report for accounting purposes, the “Sales Report” can be more useful in the planning of your business. You can use this report to sort sales by employee, category, or location, which is especially useful when franchising. By viewing both summary or detail views, you can dig into what service and product categories are doing the best, or which may need a revamp. 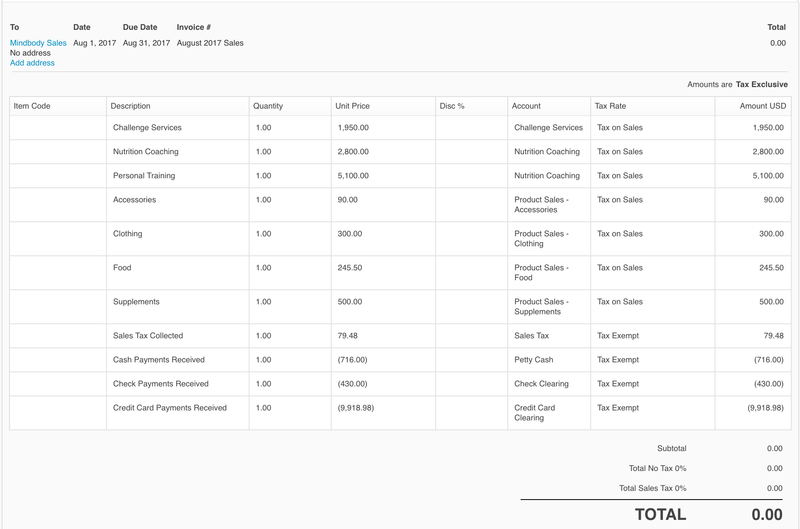 Payroll Report – Use this report to view your staff’s classes and sales, which will then be entered into your payroll software for payment. You can also run a report to view specific sales categories only, if wanting to compare the cost of specific classes being offered. Cancellations Report – Use this report to view cancellations made by clients or staff members. If you are seeing a large number of cancellations from specific clients or on specific dates and times, you can use this information to reach out or to change times and dates to those that may better suit your clients’ schedules. Autopay Detail Report – You can use this report to look ahead at scheduled autopayments. This can be useful to look at when during the month you receive the most income. For instance, you might be making $50,000 per month and have a budget setup to account for this. However, if most of this money is being deposited in the beginning of the month, it may give you a false sense of available funds. Retention Report – The retention report is great to use in conjunction with the Last Visit Report. Your gym may run a 60-Day Challenge and sign up 50 new members. Using the retention report after the challenge is over will show you how many of those clients decided to maintain their membership, or sign on for more personal training, and thus show you the success of the 60-Day Challenge campaign. The above are just a handful of the reports offered by Mindbody. They have a slew of additional reports that can be customized to suit your specific business’s needs. 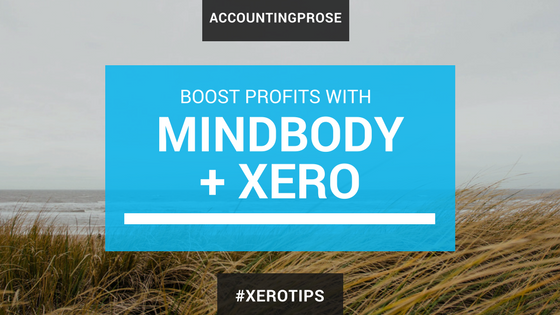 Accountingprose loves working with Xero and Mindbody! In fact, we will be in attendance at BOLD – the Mindbody Conference taking place September 27-29, 2017, in San Diego, CA. If you own a health and wellness business, we think this is the place to be. You can Register Here and make sure to stop by a wellness class to pick up some free (nerdy accounting) swag! Want to meet for a cup of coffee at the conference? Send a tweet to @accountingprose and we'll set up a time to chat!